A $50,000 grant from the McCormick Foundation is supporting SIUE’s pilot implementation and research of the scenario, under the direction of Anni Reinking, EdD, assistant professor in the School of Education, Health and Human Behavior’s Department of Teaching and Learning. The project is in partnership with Illinois Action for Children. According to Reinking, the benefits of this technological approach are abundant. Engaging teacher candidates and early childhood educators in virtual learning environments increases the human capital of the workforce, provides experiences in a cyclical learning model and provides real-time feedback for individuals. The University of Central Florida engineered the virtual environments. Its TLE TeachLivE™ Lab is currently being used for pre-service and in-service teacher training at over 85 campuses in the United States. SIUE will be the first to use the early childhood scenario in the research phase. SIUE’s virtual learning environment has boosted teacher candidate preparation, and students will benefit further from Reinking’s pioneering work with the program. Next, Reinking plans to apply for a McCormick Foundation planning grant which would be used as a catalyst for meetings, planning sessions and networking in order to take the early childhood scenario statewide. 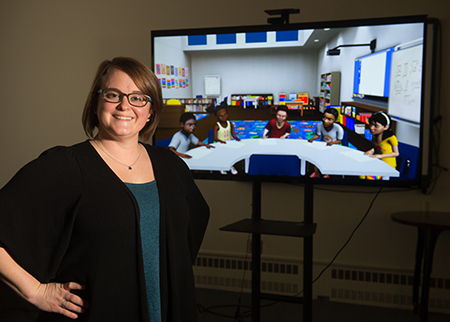 Photo: Standing in SIUE’s virtual learning environment is Anni Reinking, EdD, assistant professor in the School of Education, Health and Human Behavior’s Department of Teaching and Learning.